AKG’s C414 has been a studio favourite for decades. Does this new, more affordable model hit the same spot? Launched at the Frankfurt Musikmesse in early 2015, AKG’s new C314 is positioned near the top of the company’s project–studio microphone range, effectively filling the space left by the discontinued C4000. As the numbering implies, this new model sits above the fixed–cardioid C214 but below the C414 XLS, and re–introduces a multi–pattern model into AKG’s family of large–diaphragm back–electret microphones. Sharing a very similar styling to the C214, this new dual–diaphragm microphone is almost exactly the same size too, at 160mm in length, 55mm wide and 43mm deep. It is about 20g heavier than the C214, at 300g — and happens to be exactly the same weight as the slimmer and narrower C414 XLS flagship microphone. On first handling the C314, it feels reassuringly well built, robust, and rugged — but then it is designed for stage use just as much as for project studios. A dual–layer, all–metal mesh grille provides both wind–shielding and RF screening, with the familiar black coating to identify the microphone’s rear side. Supplied in a very smart carrying case, complete with a foam windshield, AKG’s neat quick–grip spider suspension, and a simple stand adapter, the C314 can be bought singly or in precision–matched stereo pairs. The latter are also supplied in a (larger) single case, with all the same accessories plus a stereo bar. Polar pattern selection is via a ‘traditional’ four–position slide switch on the rear panel — reminiscent of the older C414 microphones, rather than the sophisticated electronic switching of the current models — and the pattern options are omnidirectional, cardioid, super–cardioid, and figure–of–eight. Two additional slide switches, one on each side of the mic’s body, select a 100Hz 12dB/octave high–pass filter and a 20dB pad. Just below the pad switch, a flush–mounted LED illuminates green when the mic is powered, and flashes red if the level gets within 2dB of overloading the impedance converter — at which point the pad should probably be switched in! The microphone is rated with a maximum SPL capability of 147dB A–weighted, which should cover most eventualities. The slide switches seem quite robust and are easy to adjust despite being recessed into the body to prevent accidental damage. At the heart of the C314 is a one–inch, edge–terminated, dual–diaphragm capsule which is mounted within a clever internal suspension arrangement to minimise noise from mechanical vibration. The front and rear diaphragm assemblies are apparently computer–matched prior to assembly to optimise the accuracy of polar patterns and frequency responses. Marketing materials for the C314 make a big deal of its C12 and C414 family lineage, and even state boldly that the gold–plated diaphragm material is the same as that used in the current C414 XLS. However, that doesn’t mean the entire capsule is the same, and in fact — like its sibling the C214 — the new C314 model uses a back–electret capsule. In this respect the C314 is far more similar to the discontinued C4000 than the DC–biased flagship C414 XLS and XLII models. Not that there is anything wrong with modern back–electrets at all [see the DPA review elsewhere in this issue — Ed. ], and AKG have undoubtedly developed large–diaphragm back–electret technology to very impressive levels indeed. The C314 certainly impresses with its self–noise performance, which loses only 2dB in comparison to its DC–biased cousin. Looking at the technical specifications, the C314’s sensitivity is fairly typical at 20mV/Pa, and self–noise is given as just 8dBA, which, although not class–leading, is still a very respectable figure indeed and 5dB quieter than the C214. Although many AKG mics will work happily on phantom power supplies anywhere between 9 and 52 V, the C314, like its C414 cousins, will only accept the standard 48(±4)V range, and requires a relatively modest 3mA of current. The frequency response plots for each polar pattern all show a characteristic presence peak centred around 10kHz (slightly lower for the figure–of-eight mode), and a dip around 2kHz. Both the peak and dip vary in amplitude with the different patterns, amounting to roughly a 5dB boost and 2dB dip for the cardioid and super–cardioid modes. The figure-of-eight mode has a deeper 5dB dip, while the omni mode more–or–less loses the dip but has a narrower presence peak. The omni polar pattern sounds nicely consistent for all source angles and for all frequencies up to about 15kHz, above which it becomes less sensitive at the sides — which is quite normal for a large–diaphragm multi–pattern capsule. The frequency response is pretty flat and well controlled from below 20Hz right up to about 8kHz, where the presence boost provides more detail and airiness. In comparison, the graph for the super–cardioid mode suggests a slightly warmed mid-range and a broader and smoother high–end lift. The expected 120–degree nulls are well defined through the mids between about 200Hz and 2kHz, but fill out noticeably above and below to give around 10–15dB attenuation instead of 20dB plus — although that is still very workable in all but the most demanding situations. Switching to the cardioid pattern revealed very similar tonal characteristics, but I was slightly disappointed that the polar pattern doesn’t offer as much rearward discrimination as I expected. A deep 180–degree null could be found across the upper mid–range — between 300 and 800 Hz or so — but above and below that region the rearward attenuation falls again to 10–15dB. The C214 model actually performs a little better in its rearward rejection, in comparison, and the C414 XLS offers a much better-defined cardioid pattern. Moving finally to the fig–8 mode, the polar pattern is very good indeed, with nice deep side nulls across the entire bandwidth, albeit softening slightly above 15kHz. The frequency response takes on a more pronounced character, though, with an obvious upper–mid bloom and that universal HF presence lift. The combined effect gives quite a dry, ‘skinny’ bass with a slightly recessed upper mid-range. I suspect many will be hoping that the C314 is a low–cost version of the reference C414 XLS, but I’m afraid I have to say no, it’s not! First and foremost, it doesn’t match that model’s impressively flat and neutral frequency response, which is fundamentally what allows the C414 to serve as such a good all–rounder in the studio. Instead the C314 has that distinct HF lift and upper–mid bloom character in most of its polar pattern modes. That’s not to say the C314 is a bad mic at all — it performs very well indeed — but it does have a sound character that isn’t present in the C414 XLS. What this means in practice is that the C314 will tend to complement and enhance some sources very nicely, but grate and clash sonically with others — but to be fair this feature is familiar to most large–diaphragm microphones. The four patterns are well defined and provide useful versatility, although cardioid mode isn’t quite as discriminating between front and back as some alternatives. 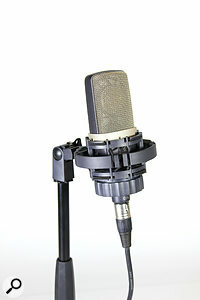 I also found it was impossible to get at the polar pattern switch (or the pad and filter switches) when the mic is mounted in the supplied spider shockmount, but at least the neat rotating clutch design allows the mic to be released quickly and easily if access is required mid–way through a session. 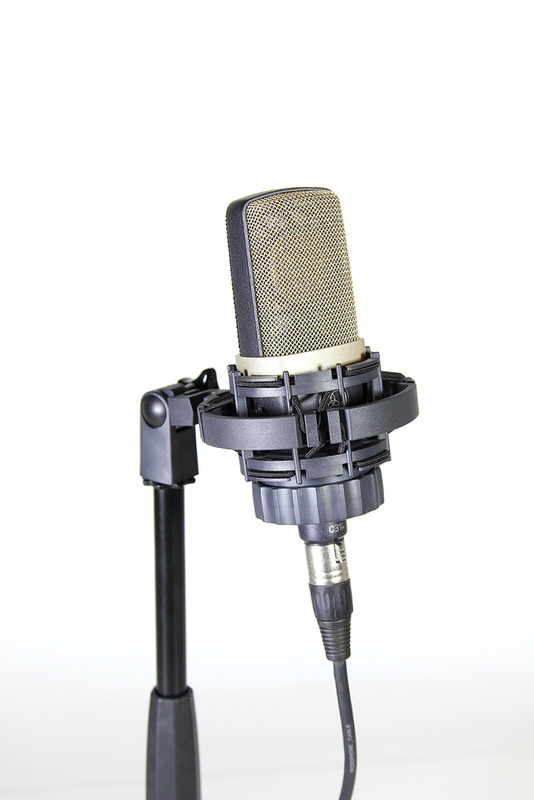 As a versatile and high-quality multi–pattern mic, the C314 has a lot going for it. The build quality is excellent, it is supplied with a useful set of accessories, it has a high maximum SPL capability, and an impressively low–noise output. It also sounds very good overall, albeit with a sound character that leans towards warm and bright rather than stoically neutral. As a model aimed at live and studio applications, it’s sensibly priced around £200$400 less (on the street) than a C414 XLS, which represents good value for money, making it an attractive option to many. I can see the C314 becoming a popular option and would look very favourably upon it as an excellent replacement for my much–loved but discontinued CAD M179s as a versatile workhorse mic. Amongst the multi–pattern microphones in a broadly similar price range, the lovely Audio–Technica AT4050SM is priced closer to the C414 XLS, while the Rode NT2000 and Sontronics Orpheus are slightly cheaper, as are the Audix CX–121B and CAD Equitek M300–V2. Fine sound quality, albeit not entirely neutral–sounding. Slight but noticeable upper–mid bloom and HF presence may not work with all sources. An elegant multi–pattern, large–diaphragm addition to AKG’s back–electret family, filling the hole left by the discontinued C4000 very nicely. £579, stereo pair £1319.Prices include VAT.